[By CT] If there are two words that bring me a greater mixed reaction when it comes to edible treats, I don’t know what they are. On the one hand, I think of the awesome sugar cookies that my family received from Nancy McEntire every year. The cookies were the perfect consistency and had the right amount of decorative icing on them. On the other hand, it seems some people go nuts with Christmas cookies every year and try to find ways to include as many ingredients as possible. Does a cookie need to have coconut, almonds, marmalade and raisins to be Christmasy? Stop treating cookies like fruitcake. 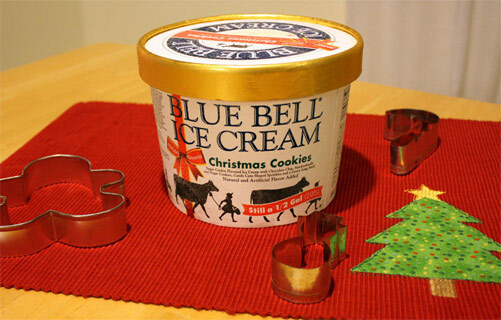 All that said, when Dubba asked if I’d scope my area for Blue Bell’s Christmas Cookies holiday flavor, I felt that internal mixed reaction all over again. However, once I read the description, my mind was put at ease. My fear of having to eat pecan-topped, cranberry-stuffed, gingerbread cookies in a peppermint swirl were gone. 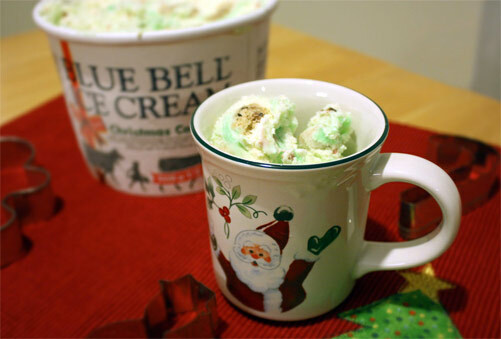 "Christmas Cookies Ice Cream combines your favorite holiday cookies – chocolate chip, snickerdoodle, and sugar – in a tasty sugar cookie ice cream with red candy cane shaped sprinkles and a green icing swirl throughout." Even after reading the description, I worried that the mentality of throwing everything into the recipe might work against this. I mean, Chocolate chip cookies—awesome. Snickerdoodles—pretty good. Sugar cookies—really good. Together in one ice cream? I don’t know. So, I ran by the local Winn-Dixie, which has a pretty good assortment of Blue Bell flavors, and picked up what appeared to be the last Christmas Cookies flavor. As I was checking out, the cashier commented that she would have to go get some herself before leaving work. When I informed her that I got the last one, a fight nearly broke out. Then I explained that I was buying this so I could review it for OnSecondScoop.com and a hush fell upon the store and I was allowed to leave with it. I am a fan of Blue Bell. Their ice cream has a weight to it rather than feeling airy and lacking substance as some other brands do. Their assortment of flavors are impressive. I haven’t tried them all, but I’ve found they do a good job balancing the mix-ins with the ice cream itself. This time was no different. “Christmas Cookies” contained marble-sized chunks of cookies. Each chunk was it’s own type of cookie and was relatively well-spaced apart from another chunk. The pieces were big enough that when you bit into them, you knew instantly what type of cookie you were chewing. The snickerdoodle was probably the strongest flavor of the three due to its cinnamon. The sugar cookie chunks were my favorite though. There were also waves of green icing flavoring and specs of red candy sprinkles. This icing flavor is probably why the sugar cookies worked so well in this. It took me back to the days of Nancy McEntire’s annual cookie tins. The chocolate chip cookie chunks, while good, seemed to have the least impact on me. Maybe because at this point it’s not that big of a deal to see chocolate chip cookie components in ice cream. I’d have just assumed they give up their seat in the ice cream for more sugar cookie chunks. Unlike my last review where I only got a pint, this time, I obtained a half gallon, something Blue Bell prides themselves on still providing. This meant, I had more opportunity to play. And since I was eating cookie ice cream, it only made sense that I had some milk to go with the cookies. 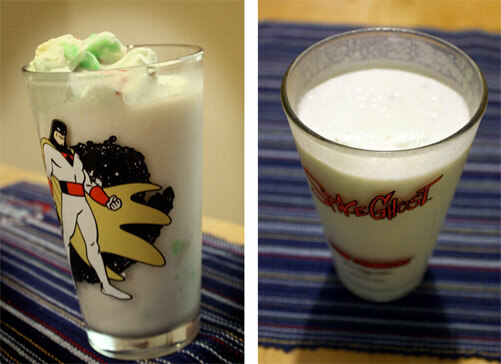 So I made myself a Christmas Cookies Milkshake. Oh man…this was good stuff. Assuming you keep your milkshake heavily weighted on the ice cream side and not too liquidy, this works. The milk cuts down the super-sweetness a bit which was something I hadn’t picked up on until doing this shake. This flavor was a big hit with me and (because I got a half gallon I actually shared) my family. While it is a holiday flavor, I would love to see some version of it remain around all year. I would definitely count this among my favorite of the Blue Bell flavors and look forward to finishing off the remaining amount in my freezer. And maybe this year, instead of leaving Santa milk and cookies, we leave him a bowl of this stuff! Note: You can hear CT on the Nerd Lunch Podcast weekly available from iTunes and Stitcher. Christmas Placemat by Janay of stitchedbyjanay.com.